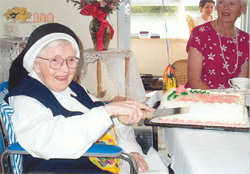 August 1 was a day of great rejoicing for the family and friends of Sister Catherine Kenny and the sisters of our Congregation as Sister Catherine celebrated her 100th birthday at McAuley Convent. The celebration began with the Eucharistic Liturgy which was followed by a delicious meal in the dining room. Greetings and best wishes came to Sister Catherine in the form of an apostolic blessing, cards, certificates, letters and visits not only from sisters within the Congregation but also from many of the former students of the School of Nursing of St. Clare's Mercy Hospital where she had been the director of the school for thirty years. Of particular interest was the lengthy letter that she received from the Premier of the Province, Honourable Danny Williams. After expressing congratulations and best wishes to her, he continued on to say "with great wisdom you have taken to heart the promise that God made to Solomon in 1Kings 3:14 'If you walk in my ways, keeping my statutes and commandments, as your father David walked, then I will prolong your days". He thanked her for "all the wonderful work you have done over the decades to be merciful to those around you who have been in need of care, comfort and guidance. In countless ways, both large and small, you have made a positive difference in the lives of multitudes of people and for that you are cherished by all who have been touched by your love and grace. You remain a beacon of light to us all." The Premier then went on to "commend the Sisters of Mercy for a remarkably strong contribution to Newfoundland and Labrador over the years. I believe historians, looking back on the story of your Order, will appreciate more and more just how powerful a presence you have been in our communities and just how greatly you have contributed to the spirit of cooperation and caring that defines Newfoundland and Labrador". Fortunately, Sister Catherine was well enough to enjoy the day and to be present at all of the festivities. She is now our second living centenarian and the fifth of our Congregation who reached that age.